Hey Now Hooping produces handmade specialty hula hoops from high-quality materials. Our hoops are so well-made, they come with a one year guarantee! 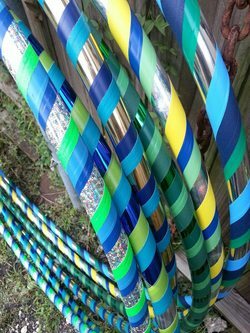 If your hoop bends or breaks, we will replace it for free. We will work with you to make a hoop that is the perfect dimensions to ensure your hooping success. There is a hoop for EVERY BODY! Youth hoops start at $35, adult hoops at $40. Wholesale and bulk pricing available. Contact Hey Now Hooping for sizing details and custom ordering.